My son loves to flail his arms around in his sleep. Ive tried swaddles, sleep sacks, holding his arms down while I hover above him trying to lull him back into sleep. 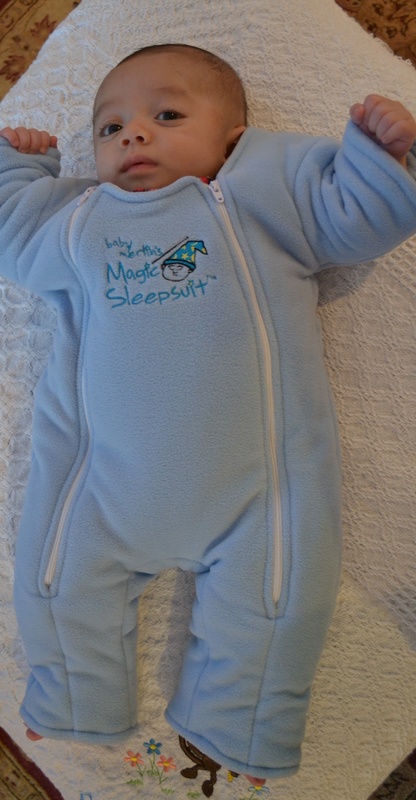 I picked up the Merlins Magic Sleep Suit with hope, that this one device would allow me to walk away from him without worrying that he would flail himself awake once again. Yesterday, we watched Resident Evil, while Ethan laid asleep in his suit. It was the first time he actually didnt wake up during the movie. The first movie my husband and I were able to enjoy all the way through (in 3 months!). Thats worth cash money. These little beauts are Honest Diapers. Cute little eco friendly diaps, from Celebrimom Jessica Alba. My son, Ethan loves em. And his buns get all sorts of attention when he wears them, but they arent just cute – made from plant based materials and good for the environment stuff – you can feel good as everyone is oohing and ahhing over your babies cute little behind.